Women’s League of Burma (WLB), Network for Human Rights Documentation-Burma (ND-Burma), the Assistance Association of Political Prisoners (AAPP), the Vimutti Women’s Organization (VWO) and Asia Justice and Rights (AJAR) are calling for an end to torture, and for rehabilitation of torture survivors. 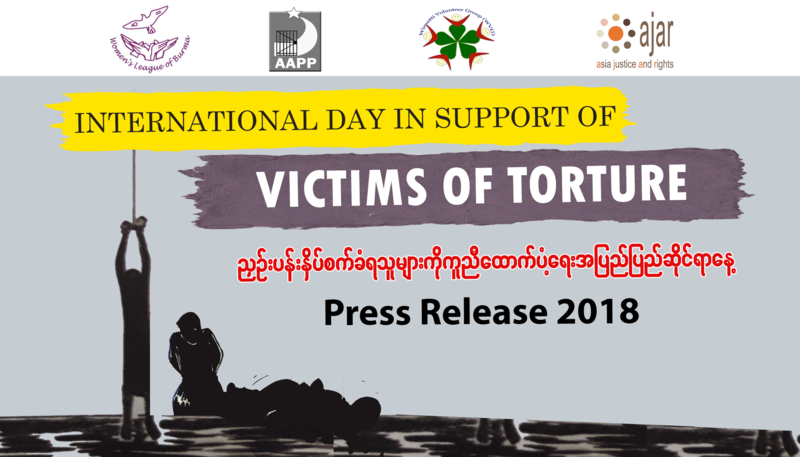 WLB, ND-Burma, AAPP, VWO and AJAR are jointly organising a public event in Yangon to mark the International Day in Support of Victims of Torture. The event will be held from 1:30-3:30pm at Free Funeral Service Society. At the event, participants will show their solidarity with survivors of torture and raise awareness on the needs of victims. The Burmese language version of the United Nations Convention Against Torture (CAT) produced by AAPP will also be distributed to the public. Torture is not a practice of the past; it continues to be used in Myanmar by State actors, in particular in ethnic areas affected by current conflicts. Torture is still used during detention and interrogation, often in an effort to procure information or to force confessions. Villagers suspected of being affiliated with ethnic armed groups are frequently captured by military and tortured indiscriminately. Torture also includes acts of sexual violence. It is the government’s responsibility to stop and prevent torture in its jurisdiction. The government must ratify the United Nations Convention Against Torture, and other Cruel, Inhuman, or Degrading Treatment or Punishment (CAT). It would be an important first step in ending the practice of torture in Myanmar. It would also be a symbolic pledge of solidarity with survivors. Torture survivors have a right to reparations and support. Many face ongoing and serious health problems. Access to medical care is an urgent need. Other needs include psychosocial support, vocational training, and public acknowledgement. Reparations and addressing the needs of torture survivors must be priorities of the government. They should be items for discussion in parliament and must be included in current peace process discussions. The Women’s League of Burma (WLB) is an umbrella organization comprised of 13 women’s organizations of different ethnic backgrounds from Burma. WLB was founded on 9th December 1999. Its mission is to work for women’s empowerment and advancement of the status of women, and to work for the increased participation of women in all spheres of society in the democracy movement, and in peace and national reconciliation process through capacity building, advocacy, research and documentation. ND-Burma formed in 2004 in order to provide a way for Burma human rights organizations to collaborate on the human rights documentation process. Seven member organizations and nine affiliate organizations seek to collectively use the truth of what communities in Burma have endured to challenge the regime’s power through present-day advocacy as well as prepare for justice and accountability measures in a potential transition. ND-Burma conducts fieldwork trainings; coordinates members’ input into a common database using Martus, open-source software developed by Benetech; and engages in joint-advocacy campaigns. When possible, ND-Burma also collaborates with other human rights organizations in all aspects of its work. AAPP was founded in 2000 by former political prisoners living in exile on the Thai/Burma border. Since then, the organization has been run by former political prisoners, and has opened offices inside Myanmar in Rangoon and Mandalay. AAPP advocates and lobbies for the release of remaining political prisoners and for the improvement of the lives of political prisoners after their release. The various assistance programs for political prisoners and their family members are aimed at ensuring they have access to education, vocational trainings, mental health counseling and healthcare. Vimutti Women’s Organization (VWO) is a community-based organization, which was created in 2009. Vimutti is a Pali word (Myanmar ancient literature), which means “freedom”. All VWO members are socially minded volunteers. VWO is very active in communities doing social work, humanitarian support, and providing educational charity to children from poverty-stricken families. VWO is directly engaging with vulnerable people to create a healthy societal environment through research, advocacy, networking, and improving their collective capacity development. VWO has a special program for strengthening women former political prisoners. AJAR is a regional human rights organization based in Jakarta. AJAR works to increase the capacity of local and national organization in the fight against entrenched impunity and to contribute to building cultures based on accountability, justice and a willingness to learn from the root causes of mass human rights violations in Asia Pacific region.